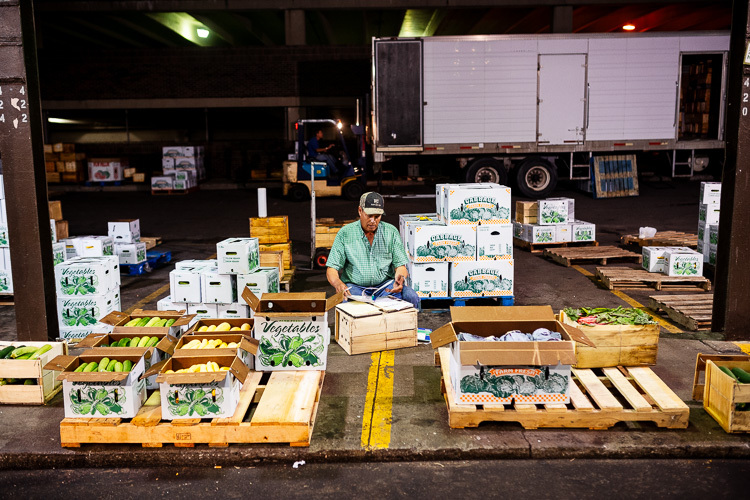 Between midnight and 6 a.m., Monday through Friday, every spring through fall, dozens of farmers fill Eastern Market's sheds with pallets of fruits, vegetables, and herbs. The larger farms bring their crew and set up impromptu office spaces centered around desks dropped into their shed via forklift in the middle of their produce. Smaller famers bring a truck and friend to deliver boxes of produce to buyers. What are they all doing here in the twilight hours in Detroit's enormous open air market? Selling to distributors, restaurants, grocery stores, and other food businesses. 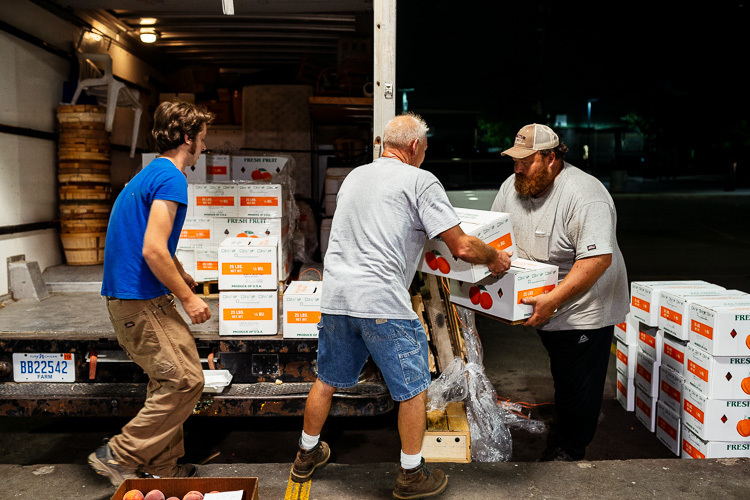 These nights, when the vast majority of the population is asleep, are quietly responsible for the much the food we eat in the metro Detroit region. The vibe is far less bustling than Saturdays at Eastern Market. The night hums with the idling of diesel engines and the whizzing of forklifts dropping off boxes from shed to truck. 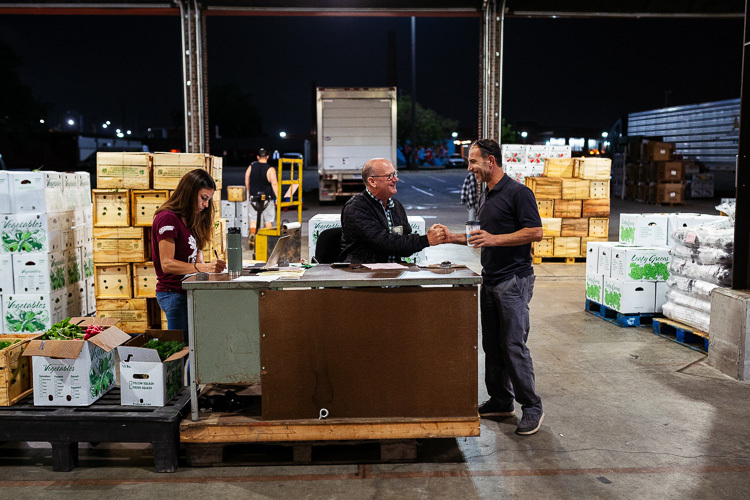 After farmers shake hands and a deal is complete, forklifts manned by their crew almost wordlessly start zipping around, delivering the purchased produce into the customer's truck. Patrick Rickert (left), owner of Rickert Orchard based in Yale, MI, was selling peaches. When asked at 2:45 a.m. about the timing of wholesale customers, he said matter-of-factly, "I'd like it if they all came at once, but that's just not how it works." 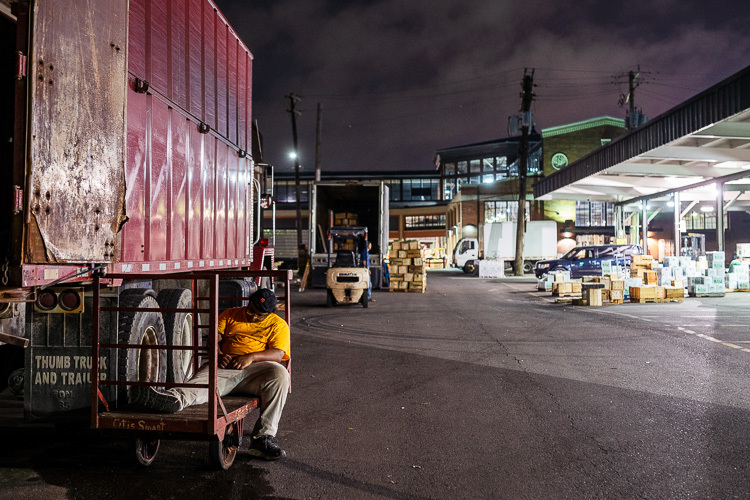 Buyers don't typically come in the middle of the night, preferring to shop around when the market opens at midnight or later in the morning closer to 6 a.m.
A customer (above) waits in his semi-truck for an order to arrive. Brendan Bielat (above) was selling cucumbers and yellow squash. 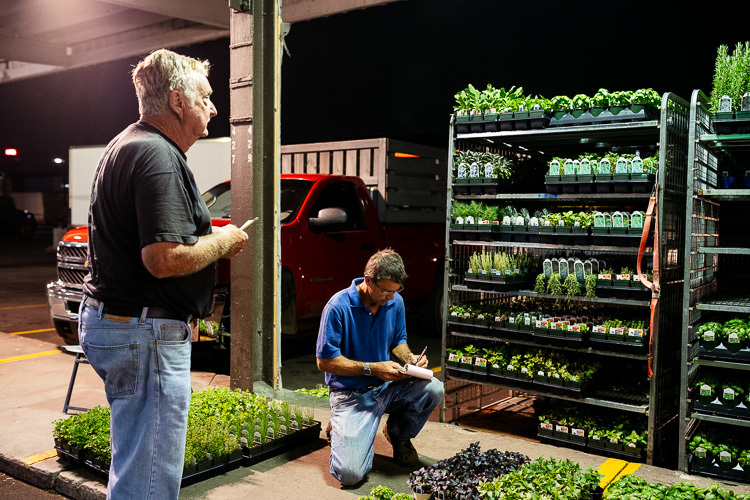 Based in Richmond, MI, his company, Brendan Bielat Greenhouses, has been selling at the wholesale market for close to 40 years. Larry DeCook (above) writes down a customer's order. DeCook comes from five generations of farmers who have all sold at Eastern Market. He personally has been working the market for over 40 years. Tim Campbell Farm (above) makes a sale. Another one of the farm "offices" (below) set up at the wholesale night market. 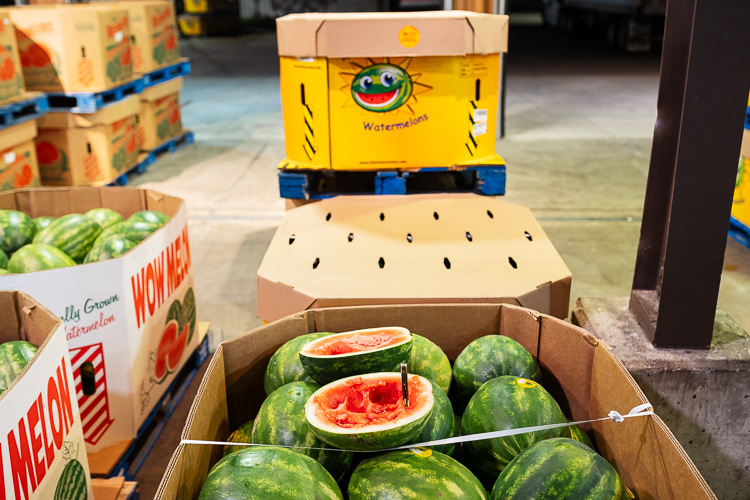 A sample watermelon for wholesale buyers to try. It's late at night and not uncommon to see people napping during slow moments. Many of the workers will return again the following night.